A sauce is a seasoned liquid used as an ingredient and dishes, and as a condiment. As a condiment, it may be applied just before serving, or set at the table for a diner to apply him or herself. A sauce can be savoury, sweet, sour, or sweet and sour. Classical French sauces are amongst the world’s most complex to make; Japanese sauces are perhaps the simplest. Remember that as any sauce thickened with a starch cools, it will thicken even more. So, cook a sauce to just a smidge less thick than you would like, to allow for what is going to happen as it cools. Otherwise, your guests may be scooping up spoonfuls of a congealed substance. We know that sauces have been made for at least as far back as we have any archaeological records. Many recipes still exist for Roman, Medieval and Renaissance sauces, but to our tastes, they would seem rather more like chutneys now. The Romans called their sauces “juices”, or “ius” in Latin. The French still don’t have a word for gravy, they call it “jus”, their word for juice. The Romans heavily spiced their sauces and thickened them with bread, just as people of British Isles extraction still do with their “bread sauce”. The most famous Roman sauce was “garum”, a sort of fermented fish sauce, of which there were several versions. After the fall of the Western Roman Empire, the Byzantine Empire kept on making it. By the Middle Ages, people had begun to use the French term “sauce”, which became “salsa” in Spanish. Bread was still being used as a thickener, but some people were using ground almonds. By 1400 sauces were less overwhelmed by spices, and someone had come up with the idea of using flour as a thickener because it was a more neutral taste. Since the 1600s, the French have had an undisputed claim to owning the field of sauces, which even the Japanese and Chinese acknowledge. 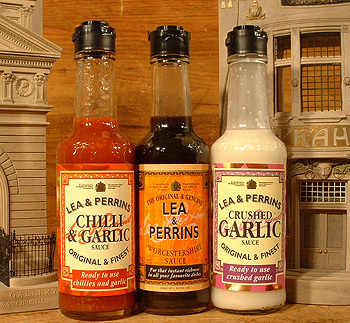 The Victorians invented three great British sauces: Worcestershire, Gentleman’s Relish and Brown (HP) Sauce. While the French were content with the fame of having their names associated with a sauce, the British were a bit more business-minded about it (after all, Napoleon had dismissed the Brits as “a nation of shopkeepers”), and invented sauces such as these that were purchased commercially rather than whipped up at home.